Pre-Sales are currently underway for their Survivors who have previously sailed on board 70000 TONS OF METAL, The Original, The World's Biggest Heavy Metal Cruise. Public Sales are slated to start on Tuesday August 16, 2016 at 3PM EDT/9PM CEST. Mark down the date and time in your calendar as they have sold out the previous six consecutive sailings to sailors from over 70 different countries! Don't miss the boat, book your cabin as soon as the gates open! 70000 TONS OF METAL, The Original, The World’s Biggest Heavy Metal Cruise offers Metalheads a life-changing experience in an incredibly fan-friendly scenario that has no comparison. Boasting the biggest Open Air Stage structure to ever sail the Open Seas, 70000 TONS OF METAL gives Sailors unrestricted festival access to all 120 live shows by 60 unique Artists on board. Not only that, throw in Meet & Greets with every Artist, exclusive Art Exhibits and Artist Clinics and the infamous JAMMING WITH WATERS IN INTERNATIONAL WATERS, the official 70000 TONS OF METAL All Star Jam hosted by ANNIHILATOR's Jeff Waters. Everyone sailing is a VIP, they spare no expense to remove seating in the theatre so that fans can create a mosh pit at sea (this is a Heavy Metal Cruise after all), and most importantly… there are bars that never close - you heard that right, bars that never close! 70000 TONS OF METAL will sail February 2 - 6, 2017 onboard Royal Caribbean’s luxurious Independence Of The Seas which will be leaving from Ft. Lauderdale, Florida to an all new Caribbean dream destination: Labadee, situated on the northern coast of Haiti, featuring pristine beaches, coral reefs and lagoon-like bays surrounded by forested mountains. Soar over the Dragon's Breath Flight Line, the world's longest zip line over water! Propel down the 300 foot long waterslides, get your adrenaline fix on the Dragon’s Tail Roller Coaster, cool off in the Arawak Aqua Park, or kick back and relax at the cabanas on Nellie’s Beach. There's no shortage of shore activities here! Don’t miss out on your chance to explore this Caribbean dream destination with your favorite Artists! Sunday February 5, 2017 is #SuperMetalSunday! Start off the best Sunday of the year with Heavy Metal bands from around the globe playing concerts on 4 different stages. Think you can make a splash? Participate in the infamous 70000 TONS Belly Flop Contest which is judged by a panel of Artists! Witness Heavy Metal history in the making with JAMMING WITH WATERS IN INTERNATIONAL WATERS - the official 70000 TONS OF METAL All Star Jam. Don’t forget your jerseys because the NFL Championship Game will also be screened on board! Not enough action for you? Throw in multiple workshops and Artist Clinics, and end the cruise with 70000 TONS OF KARAOKE for a final sing along until the sun rises! 60 Bands Representing Every Genre Of Metal! 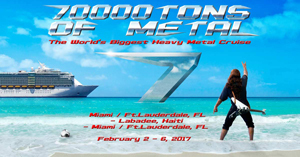 Every Artist on board 70000 TONS OF METAL 2017 will play two shows - once on the way to Labadee, and once on the way back to Florida, presenting fans with the opportunity to see 120 shows, including some exclusive performances. Check out www.70000tons.com for more information.